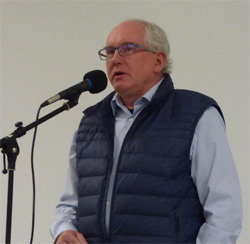 The Carleton Landowners Association (CLA) held their Annual General Meeting (AGM) on Thursday evening, October 24th, at the Johnny LeRoux Arena (upstairs hall) in Stittsville. The meeting started promptly at 7 PM, once attendees picked up their home baked goodies and a cup of coffee or tea. Tim Mount from Navan was elected as President. Most of the Board of Directors will be returning for another year to support Tim in the activities of the CLA. Shirley Dolan, Past President, who will be staying on as Treasurer and Membership Chair, spoke about some of the items that Landowners may want to watch during the next term of City of Ottawa Council. These include a review of the site alteration by-law scheduled for 2019, amendments to the Official Plan, and a review of the Ward Boundaries. These items could mean more restrictions/designations that affect private property. Glenn Lucas, Property Tax Review Services, spoke about changes to the Municipal Property Assessment Corporation’s (MPAC) methods of assessing farmland. There is an upward pressure on farm property assessments due to speculators buying up farm properties. Lucas says he has worked with MPAC to ensure that farm properties sold to a farmer are assessed differently than those sold to developers. 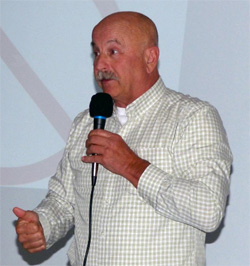 The next presentation was by Brian Gilvesy, the CEO of ALUS Canada. ALUS, an initiative of the Weston Family, seeks to partner with farmers to turn unused or marginal acreage into conserved wetlands, grassland, or buffer zones. Farmers get paid to establish and maintain ecosystem services on their land. The program is voluntary and is active in six of the 10 Canadian provinces. In Ontario, ALUS planted its roots in Elgin County. The ALUS program was also introduced to Grey and Bruce Counties as a pilot project in 2012 (ALUS Grey-Bruce), and launched in the Ottawa region, as Ontario East ALUS Inc. The ALUS program is unlike the Conservation Authorities (CA) who regulate and manage wetland designations on private property without the permission of the property owner because the ALUS program is voluntary and the farmer can opt out at any time. ALUS also compensates the owner for the land that is in their program unlike the involvement of a CA which generally significantly reduces the value of the property. The audience cautioned Mr. Gilvesy to continue to ensure that the program remained a private initiative and not to become entwined with the government, where legislation and regulation could turn a voluntary program into a permanent arrangement. The ALUS program is not available in Lanark, Renfrew, or most of Ottawa, except for the East End but we understand that discussions are ongoing to move into these areas. A program to watch.